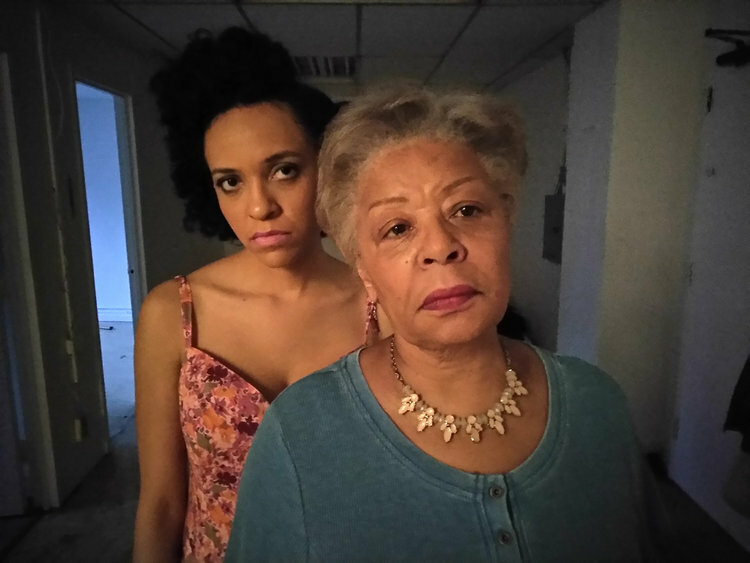 Lauren Smith (L) and Carol Carter (R) play the parts of actresses rehearsing mother and daughter roles in "Journey in Light and Shadow" by Stig Dalager. Photo by Jonathan Slaff. "Journey in Light and Shadow" by Danish dramatist Stig Dalager is a play-within- a-play for three actors. Are they rehearsing, are they performing or are they not actors at all? Is it the present, the past, or in the future? The piece is something of an examination of playwriting process, with echoes of Strindberg and Pirandello. It is adapted by Natalie Menna from the Danish translation by Robert Greer and directed by Mr. Greer. "Journey in Light and Shadow" by Stig Dalager -- 3/4 @ 8:00, 3/5 @ 4:00, 3/9 @ 8:00, 3/11 @ 2:00, 3/12 @ 4:00, 3/15 @ 8:00, 3/17 @ 8:00, 3/18 @ 8:00, 3/19 @ 4:00, 3/23 @ 8:00, 3/25 @ 2:00, 3/26 @ 4:00, 3/29 @ 8:00, 3/31 @ 8:00, 4/1 @ 8:00. Running time 90 min. plus intermission. Critics invited on or after March 11. 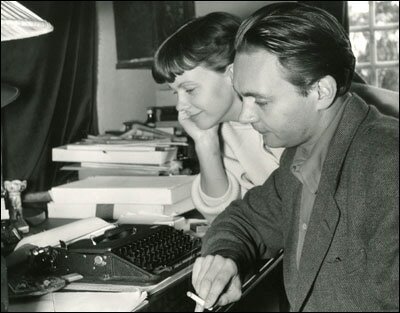 Stig Dagerman, author of "Marty's Shadow," and his wife, actress Anita Björk, ca 1950. Source: Wikimedia Commons. Stig Dagerman, the acclaimed Swedish playwright, poet, novelist and journalist, was on assignment in Paris following the liberation and fall of the Third Reich. His play, "Marty's Shadow" is a Hitchcockian tale of a scarred family of the French resistance and is inspired by the real life story of Austrian Jewish refugee, Etta Federn. It is translated by Nancy Pick with Lo Dagerman and directed by Whitney Gail Aronson. "Marty's Shadow" by Stig Dagerman -- 3/4 @ 2:00, 3/5 @ 1:00, 3/8 @ 8:00, 3/10 @ 8:00, 3/11 @ 8:00, 3/12 @ 1:00, 3/16 @ 8:00, 3/18 @ 2:00, 3/19 @ 1:00, 3/22 @ 8:00, 3/24 @ 8:00, 3/25 @ 8:00, 3/26 @ 1:00, 3/30 @ 8:00, 4/1 @ 2:00. ​Running time 2.5 hrs plus intermission. Critics invited on or after March 10. Tickets $20 general admission; seniors and students $15. Student groups $10.